Two of my favorite cookies, Palmiers and Macaroons, just happen to be incredibly delicious and incredibly easy to make. I can’t pass LePanier in the Pike Place Market without picking up an elephant ear shaped palmier cookie. I love biting into the crisp, yet chewy puff pastry interspersed with carmelized sugar. They’re super easy to make at home with only two ingredients, well, three if you count the salt. They practically make themselves. 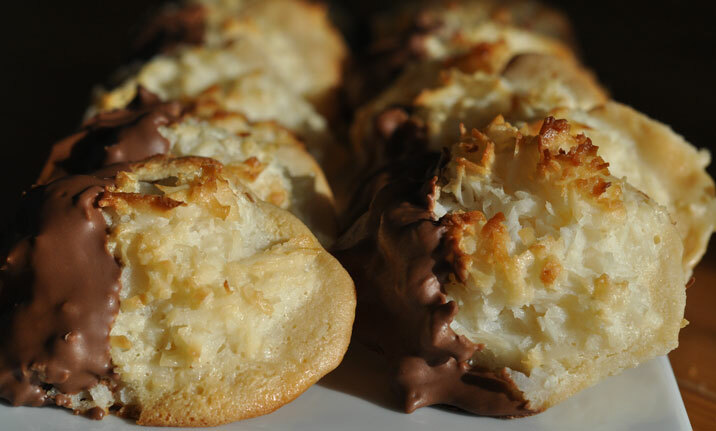 And, who doesn’t love a chewy, sweet coconut macaroon? Especially dipped in chocolate. 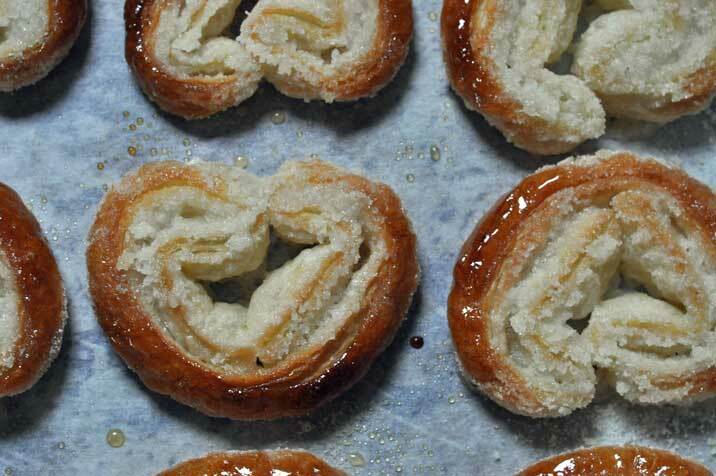 Just as easy to make as the palmier; but, with a whopping five ingredients. Dipping the macaroons into chocolate is optional; they’re wonderful either way. Combine the sugar and the salt. Pour 1 cup of the sugar mixture on a flat surface and unfold the first sheet of puff pastry on it. Evenly sprinkle 1/2 cup of sugar mix on top of sheet. Lightly roll the sugar in until the sheet is a 13 inch square. Fold the sides of the square toward the center so they go halfway to the middle. Fold them again so the two folds meet exactly at the middle of the sheet. Finally fold one half over the other. Slice the dough into 3/8 inch slices and place the slices, cut side up, on parchment lined baking sheets. Place the second sheet on the sugared board, sprinkle with the remaining 1/2 cup sugar mixture and repeat the steps above. Bake for 6 minutes or until carmelized at 450 degrees then flip over and bake for another 3 to 5 minutes. 2 extra large egg whites, room temp. In large bowl, stir together the coconut, condensed milk and vanilla. Whip the egg whites and salt together at a high speed until medium firm peaks form. Carefully, fold the egg whites into the coconut mixture. Drop the batter onto parchment lined sheets with an ice cream scoop or two teaspoons. Bake for 25 to 30 minutes at 325 degrees. Mix together the morsels and oil in a microwavable bowl. Microwave at 1 minute intervals, Stirring well between zappings until completely melted. This is how I do it, but you can always do it the old double boiler way. Your choice. Dip each cooled macaroon halfway into the melted chocolate and then set back on the parchment lined sheet. Let set. Store well wrapped for up to three days at room temperature.